We have spent the last two weeks testing Christmas toasties, attaching clips to the van and buying rope lights. When Christmas comes we intend to be ready for it. If there is any funny business I’ll be making a playlist as well, and it will have the Pogues. It won’t have East 17 though, that would be too much. This one positively reeks of Christmas, and even Barny, sworn believer that Camembert is just rubbish Brie, has had to admit it’s good. To avoid the classic problem of dry turkey buy it fresh, slice thinly (about 1cm) and season, then pan fry in a hot pan with oil till just barely cooked (no pink visible on any pieces plus 30 secs). Butter the outsides of the bread, then spread cranberry sauce on one half. 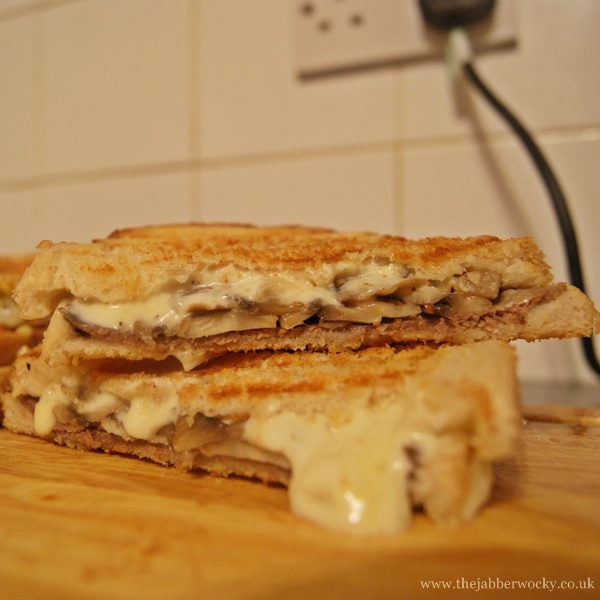 Chop the Camembert onto the other half, aiming to cover most of the bread. Arrange a generous amount of your freshly fried turkey on the Camembert, add the cranberried slice and pop in you press until the cheese is melted. Camembert has a very low melting point so it will cook faster than your average toastie, and the turkey will speed everything up if it’s hot. First, crumble the Stilton into a blender, pop in the cream cheese and blitz. This is such a cunning way to make Stilton a) even posher and b) even better: it mellows and gives it an amazing smoothness when melted, whilst allowing the other flavours to come through. It’s also the shizzle on cheese scones. Spread butter on the outside of the bread, then add a generous layer of pâté to one side and coat that with piccalilli. 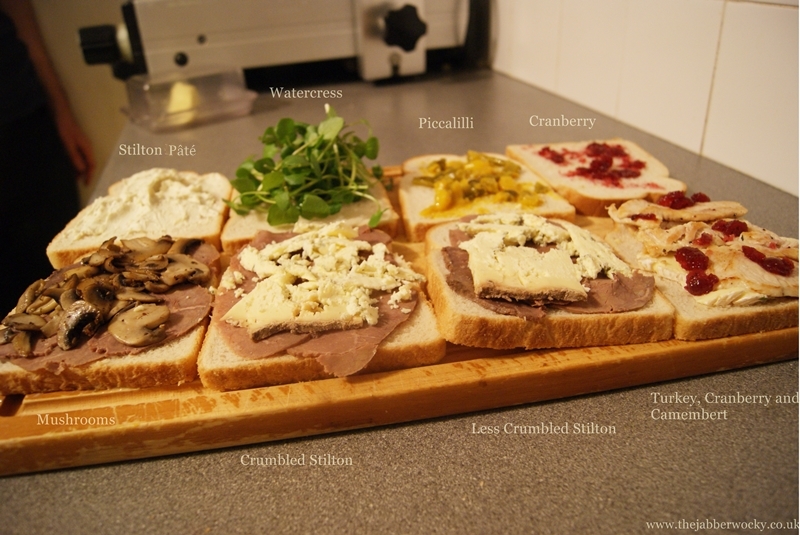 Slice your beef as thinly as you possibly can, add in generous quantities over the piccalilli, apply the top slice and toast. This keeps piccalilli in the centre and prevents sogginess. 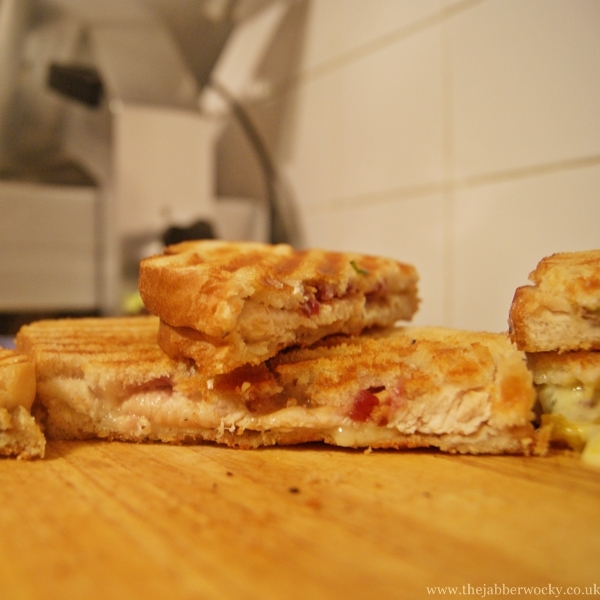 Barny doesn’t like Stilton, I don’t like piccalilli and we both like this toastie. Just saying. This mostly started as a joke, but gosh dangit the cheeky thing went and turned out to be pretty good. It’s also soon to be vastly improved when a shipment of home-made mincemeat reaches us courtesy of Barny’s Mum. 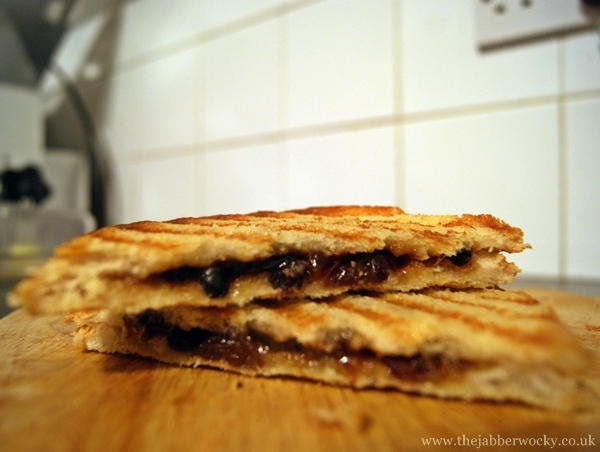 Butter the outside of your bread again, then add a solid layer of mincemeat. Toast until golden brown, then quarter and serve with a generous side of brandy butter. We have had some problems getting the brandy butter involved, as clearly the butter is best cold while the toastie is hot. Using it on the toastie meant the sugar burned and no delicious cold contrast. As a side dollop it becomes sharing-friendly, or if we could somehow get it inside the toastie after cooking… never fear, we’re not about to let some delicious, melty, flavoursome treat distract us from whatever I was trying to do. There is also an inconsistency in what I regard as thin and thick. I leave you to ponder it.